The miracle of new life, embracing your changing body, and celebrating your motherhood make maternity sessions such a beautiful experience. Choose between an in studio fine art session or an on-location shoot to capture your pregnancy. 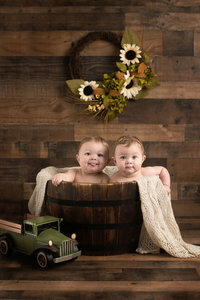 Milk baths can be added to any session for an additional fee. A studio session can take place at any time during the day, and can be considerably more intimate, highlighting the connection your share with your significant other, and your sweet new babe. Outdoor sessions, depending on location, will almost exclusively occur in the hours leading up to sunset. These sessions use the beautiful scenery in and around Tucson as a backdrop to your growing curves, and the love you share with your family. Please plan on any maternity session to last one and a half to two hours.